If my world were to cave in tomorrow, I would look back on all the pleasures, excitements and worthwhilenesses I have been lucky enough to have had. Not the sadness, but the joy of everything else. It will have been enough. This post is a bit overdue, but I will blame it on the fact that I am officially State-side once again. 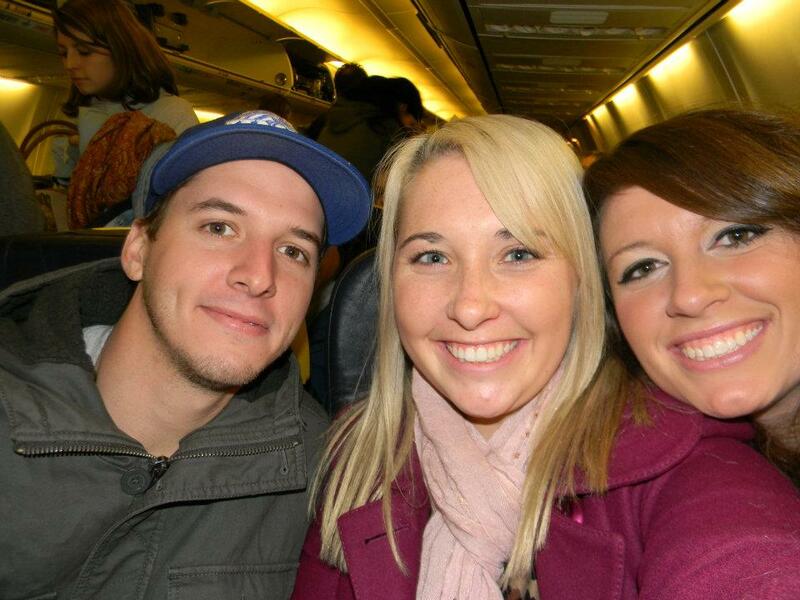 I flew in last Thursday, to the surprise of my family and friends. I told everyone I would be home on December 21. I lied. My flight was scheduled for December 15 and I let my neighbours in on my plan- surprise my parents. So, Joan picked me up from the airport and told my parents that she and her husband had an early Christmas gift for them. I pinned a big red bow to my jacket and the plan was officially in action. My parents came into my neighbors’ house while I hid in the next room. My parents closed their eyes and I snuck into the kitchen where they were standing. After receiving the go ahead to open their eyes, I was standing there beaming. It took a minute for everyone to realize what was happening, but once it clicked, my mom side swiped my dad across the kitchen and the hugs began. From then on, it has been a constant process of texting friends and catching up. Wilmington is hardly London, but it has been really fantastic to see everyone. The questions are all the same: What’s it like? Have you met lots of new people? Any love interests? How is school going? The answer will always be this: London is the best decision I have ever made. It was a decision I made by myself, for myself and I’m loving every single minute of the life I have created there. I have no regrets and look forward to picking up right where I left off, making the most of everything. Everything else is just a minor detail in this great new chapter. You probably will not hear from me until I return on January 11, this time with my best friend in tow. So, until then- enjoy your holiday, whichever one you choose to celebrate. Have a fantastic new year and make those resolutions count. He knew he could never hold that girl, she was born to see the world. I tried to set this blog up with a video, but my efforts have failed me. You guys are missing out, trust me. So instead, here we are. All set for Ireland. It took us longer to get settled in our seats than we got sleep the night before. I’m still amazed by the fact that one can take a weekend trip to a different country. We decided we couldn’t head home without having taken at least one trip to a new place, so we hit the internet and found £33 return tickets to Ireland. Don’t mind if we do. Friday morning, we headed to the airport at 3:30am. We arrived in Dublin about 8am and then hit the ground running. In an effort to be tourists, we bought two day passes for the hop-on/hop-off bus. And hop on, hop off we did. First stop was Trinity College, which was my must-do for the weekend. 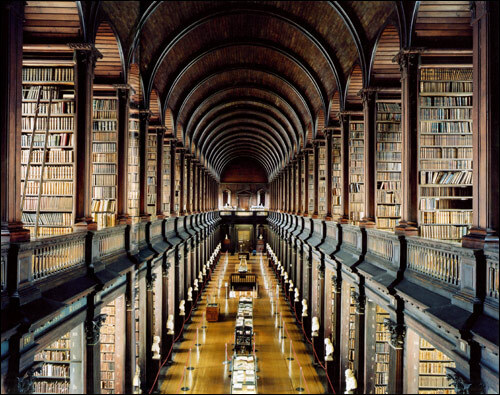 Trinity is home to Old Library- a room filled floor to ceiling with books, some of which are thousands of years old. Unfortunately, we could not take pictures, but I’ve included one from Google images. If you know me at all, you’ll know why I HAD to see this place. 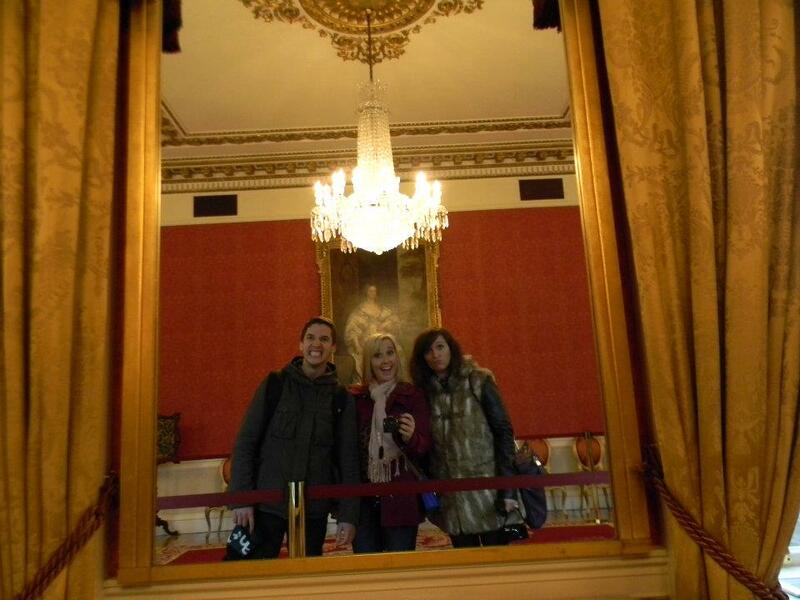 Next stop was Dublin Castle. Not too impressive on the outside, but quite beautiful on the inside. Reminded me a bit of Versailles in France, which was nice work on the part of the Irish because apparently some rooms in Dublin Castle were modeled after rooms in Versailles. Here we are looking as attractive as ever in the drawing room. Can’t believe no one wanted to paint our portrait. When the tour ended, we headed over the castle chapel. Trying to be the model citizens that we are, we sat in one of the pews for a moment. But because we can never do anything without causing a scene, as we knelt down in prayer, we somehow managed to pull the cushion off the pew and it came crashing down to the floor. So, we quickly righted the cushion and booked it. Next stop was St. Patrick’s Cathedral. Just like every other cathedral in Europe it was big and it was beautiful. The outside was surrounded by a park and on a sunny day, I’m sure it is also surrounded by people. And speaking of the weather, England totally gets an unfair reputation regarding the weather. Ireland is much worse- it was cold and rainy and windy. Returning to London felt like landing on a tropical island. 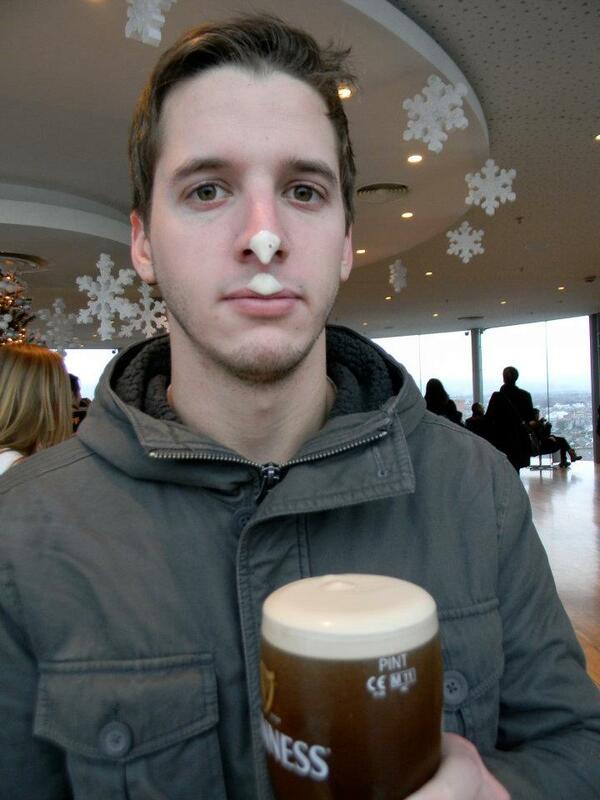 No trip to Ireland would be complete without a beer, so after leaving St. Patrick’s we bused it to the Guinness Factory. The center of the factory is in the shape of the world’s largest pint glass. After exploring 9 floors of beer history, we climbed to Gravity Bar, which offers a panoramic view of the city (and a free beer when you show your ticket.) So, Tom cashed in his ticket and we all split a pint of Guinness. I am not a fan. But Tom was. After the tour ended, we took the bus back to our hostel. What.In.The.World. I have never in my life experienced something so weird. We were put into a room with 3 French guys who knew as much English as I do French. Which is not much at all. I knew enough to converse a bit, but not enough to decipher what they were saying about us. Because I know they were saying something. I can only assume they were nice guys. Tom managed to drop all the change out of his pocket onto the hardwood floor at 6 in the morning and it was in a pile on his bed, along with his keys when we returned for the day. That’s about the only way I can measure their character. If I measured it by the volume of their snoring, they would be amazing people. 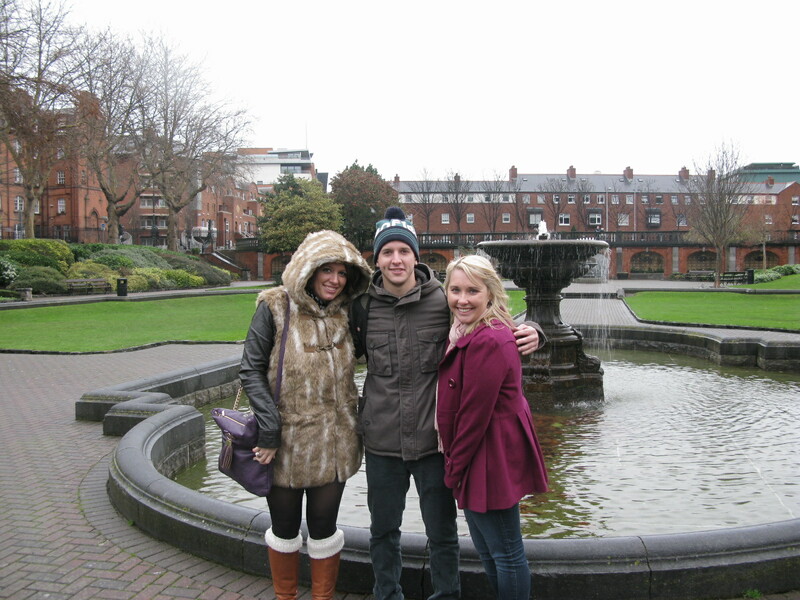 Around 7, we headed to Temple Bar, which was the most suggested stop by friends. And I can see why. Thanks to drink prices, I am now permanently in debt, but the music was good and the people were entertaining. There were more ugly Christmas sweaters floating around than the women’s department in Macy’s. And it was grand. We stayed for about 5 hours and then headed back to the hostel, as Saturday was a journey to the coast. I woke up at 5:30 to get myself ready for the trip. As usual, I headed into the bathroom for my daily shower and could not get the water to turn on. So, I woke Jordan up and we spent 10 minutes fooling with the faucet. Still nothing. I headed to reception where the guy manning the desk was so drunk he could hardly stand. After several high-fives and hugs (because I’m from Philadelphia and he loves It’s Always Sunny in Philadelphia), he was as effective as my left foot at helping out. So, Jordan and I reconvened in the bathroom. After more attempts at turning the water on, we woke up Tom. We figured it was a man’s job. Turns out it wasn’t. Tom couldn’t get the water on either. So, I went back out to the desk and thankfully someone else took over reception duties. He was able to get the shower fixed, but not until a piece of the nozzle flew off and ricocheted around the shower stall and Jordan and I dissolved into a fit of laughter. None the less, we were showered and ready for a new adventure. 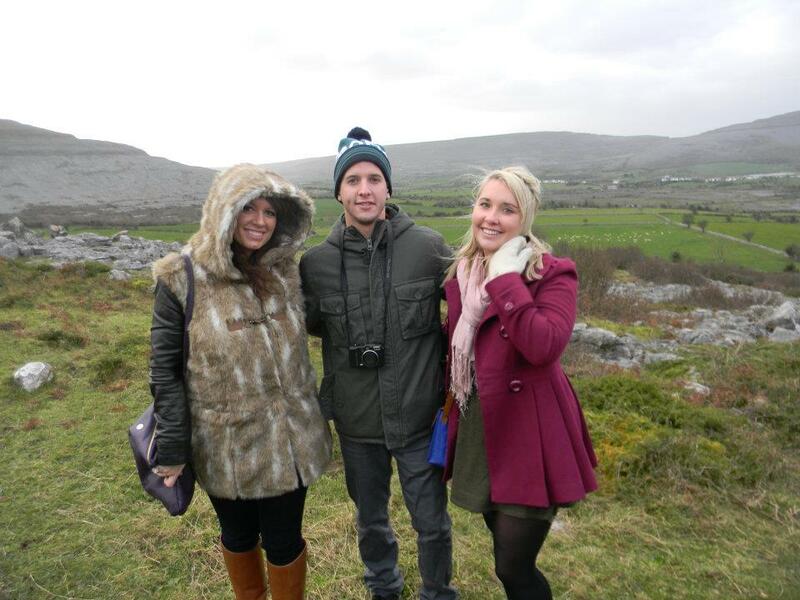 We got to Galway and were taken to a farm located at the bottom of a mountain. Which we climbed. In rather fashionable clothing. But we made it to the top and the view was amazing. This is the Ireland I had pictured in my head. I have to add that I’m not sure how we managed to make it to the top without dying. Or at least falling. Even Jordan managed to stay on her feet. This is the girl who, on the trip to Galway, missed the step that led to our seats on the bus and managed to face plant in the aisle. (Love you, Jordan.) A huge congrats to her for making it, because I know she’s reading this. The end of the climb led us into Granny’s kitchen where hot drinks and cake were waiting for us. At a price, but I’ll let that slide because the food was delish. 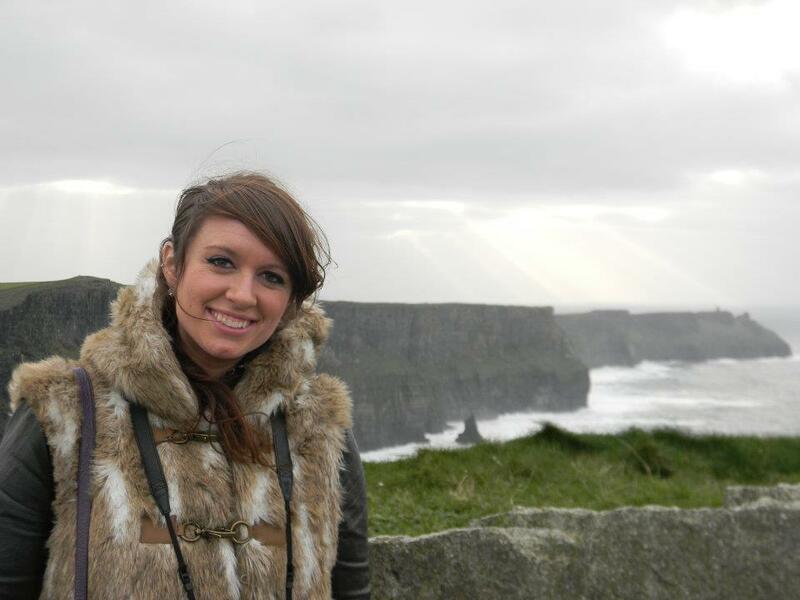 The rest of the tour led us around the west coast of the country and finally to the Cliffs of Moher. 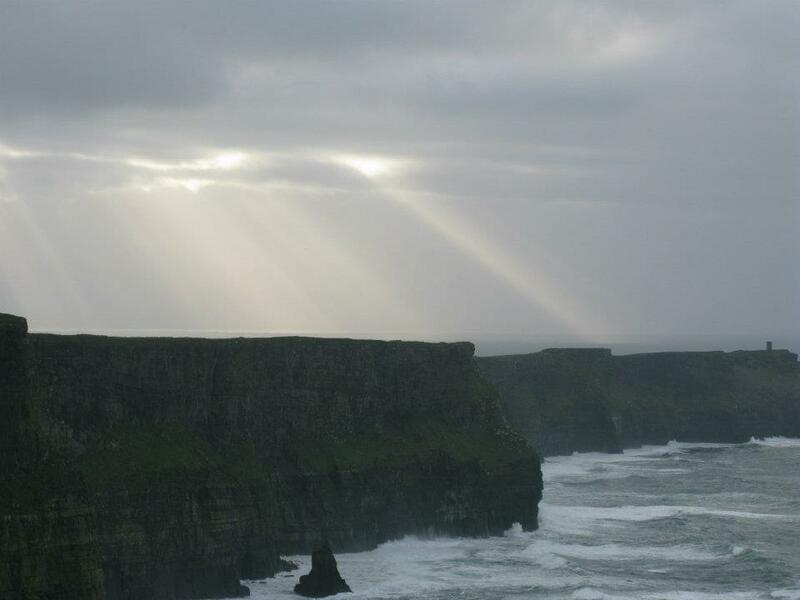 There’s not much that can be said about the cliffs except that you need to see them to understand their beauty. Following in Tom’s footsteps, Jordan and I scaled the safety wall (sorry, Mom. At least I’m back in one piece) and stood on the cliff’s edge. After leaving the cliffs, we continued our trip down the coast. We had lunch at a pub that had the most amazing food I’ve ever eaten. I may be a bit biased though, because my left arm looked appetizing by the time we ate. I even had Irish potatoes. Authentic and delicious. We returned to Dublin at 11pm and although we planned on showering and going right to bed, Tom and I were talked into going out with a Belgian couple who sat next to us on the bus all day. We were worn out but it was a great time. We started with drinks at the Temple bar and ended the night dancing and drinking at a club across from the bar. (Irish bars play the best music, by the way). We promised we’d be home by 11:30, but 2 am rolled around and we rolled into the room. 5 total hours of sleep in 4 days. 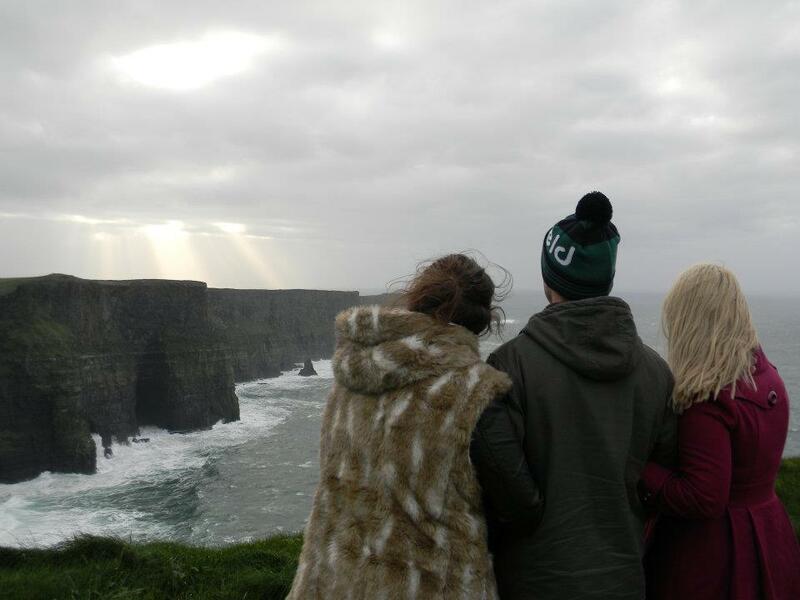 If what I’ve written above doesn’t convince you that we had a great time in Ireland, that fact should. One of my favourite (if not my favoruite) pictures from the weekend.